Grand Slam was a shy, introverted child who was fascinated with comicbooks and science fiction. This love of future technology led him to pursue a degree in electronics engineering, and eventually breezed through the military's Special Weapons School (graduating top of his class), Artillery School, and Advanced Technology School. 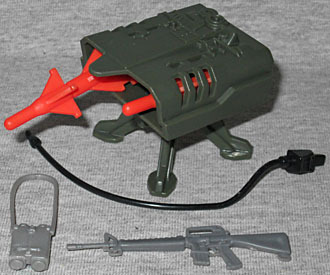 His natural skills made him an instant choice for the original GI Joe team, where he specialized in everything cutting edge, from Heavy Artillery Laser (HAL) cannons to JUMP jet packs, to miniaturized remote controlled missile systems. This is one soldier who can't stop moving forward. If he gets injured, he jumps right back up again. If he can't pinpoint the enemy with lasers, mortars or missiles, he straps on a jet pack and fires himself right on top of them. This would seem foolhardy and reckless, if his calculations weren't right on the money every single time. Just like last year, the GI Joe Collectors' Club enticed people to join the Figues Subscription Service by offering an exclusive 13th figure. Unfortunately, instead of a new character, like we got last year, this time they crapped out an utter embarrassment of a toy that had already been released in Generation 3 - the last thing we needed. Grand Slam, you may recall, was included with the "Attack on Cobra Island" SHARC in 2008. 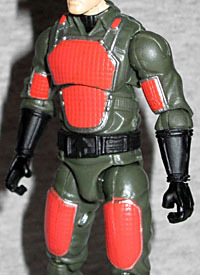 He was then available twice in the Rise of Cobra toyline. The only thing setting this figure apart from those? His armor pads are red, rather than silver - in other words, he looks almost exactly like Flash, who was available single-carded in 2008. So in short, the "premium" figure sold to us this year is functionally identical to one that was a pegwarmer in stores for $6, and is still readily available (cheap) on eBay. Thanks so much for that, Joe Club. At least now we know why they picked Bombardier to get the FSS treatment this year. 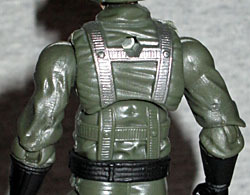 Considering that paint is literally the only thing this figure has going for it, it's really been half-assed here. His belt is solid black, the silver trim around his pads is sloppy, the stirrups under his boots are completely unpainted, and the apps on his back are incomplete. This would be shamefully amatuerish on someone's first custom figure, let alone on a real release from a (mostly) legitimate company. At least the accessories are decent. He has the typical helmet and visor combo, a gray M-16, a chunky pair of binoculars, and an olive drab version of Scrap-Iron's missile launcher thing. Presumably that's supposed to be a scaled-down stand-in for the HAL cannon mentioned on the filecard (because the 1982 original was only available with that particular piece of weaponry), and while it's a fine choice, it can't make up for the pile of ceaseless disappointment that is Grand Slam. The best thing we can say about Grand Slam is that his card art was painted by Adam Riches [never mind that, the Club just paid someone else to alter Riches' Bombardier art to create this --ed.]. Amazingly enough, there's only ever been one carded version of Grand Slam before - in 2006 - so most of his filecards have just had headshots cropped from paintings of the vehicles or whatever he was sold with. This one shows him kneeling behind his rocket launcher, using his binoculars to find the range of his target. The Bombardier and Grand Slam toys have the same head, so their portraits look alike. And look better than the god-awful ugly head on the toy. Some GI Joe fans arrange their collections by year of release: you know, all the "1982" characters in one spot, all the "1983" characters in another, etc. It's kind of a cool idea, so for those fans, getting a Grand Slam to stand in the '82 area is probably nice - except that anyone who cares that much would have already bought a Flash to put there, or thrown a little bit of red paint on one of the three Grand Slams that have already been released. It's like painting your own Bombardier, except even freaking easier. This toy is an utter waste. The Club should be embarrassed to have their name on this, and they've done a lot of embarrassing things in the past. A lot. There's a certain logic to not making a high-demand character the rare, limited release, but this also isn't much of an incentive to subscribe; if anyone had known this was the 13th figure, there would have been a ton more people picking up the individual figures they wanted.